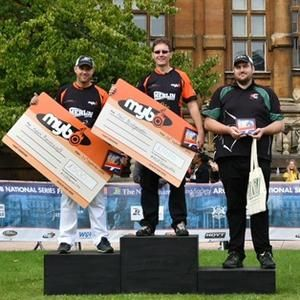 NAC compound bow archers, James Mason and Susan Corless (our Vice-Chair) shot fantastically at the final round of the National Series of shoots held at Wollaton Hall, Nottingham on the 24th September. The Gents Compound bronze medal was decided by a shoot-off. Simon Frogatt and James, who had seen off quarter final challenges from Carl Richards and Matthew Arnold respectively, ended their match at 140-140. James (on right of picture) edged it with a 10 and took the medal. In the quarter-finals for ladies, second seed Lucy Mason beat last year’s silver medallist Andrea Gales by four points and then went up against Susan in the semi’s, who had seen off a Pauline Burfitt’s challenge. Lucy beat Susan 139-128 and went on to take gold. Susan unfortunately missed out on a medal in the battle for bronze against Hope Greenwood. James and Susan ended up ranked 3rd and 4th respectively nationally. Brilliant.